As has been my custom lately, I am going to record a couple of videos with my impressions of what I saw at SHOT. Then, I will be slowly, unfortunately, working on the write-up. Unfortunately, I only had a couple of days to cover the entire show, so I am sure I missed a lot of stuff. If you thought the videos are long and boring… well, this is going to get worse. I am going to start out the written portion of this report with Tangent Theta. I have a habit of paying very close to attention to any brand or product that makes it to my list of recommendations for a variety of obvious reasons. In the last few years Tangent Theta has been mostly keeping their nose to the grind trying to keep up with demand. However, there is always some development activity behind the scenes so there are some new things coming to Tangent Theta. First of all, we can expect some new reticles, and since that is the only complaint I have ever heard about Tangent Theta, this is very welcome news. Personally, I like Gen 2 XR reticle, but it is always nice to have options. Best I can tell, they will add a model with a Horus reticle (H59 would be my guess, but I could be wrong) and a model with their own design that is sort of an evolution of Gen 2 XR. I also suspect we might see the latest version of Finn Accuracy’s MSR reticle in a Tangent Theta scope, but I wouldn’t be able to tell you when. The other two, I think, we will see this year and I will try to get my hands on the scope with their own reticle design. We had a brief discussion on what it will look like at SHOT and I think it will work well. However, I would rather not go into details until I see the final version. The initial model that will show up around mid-year will have 1/4 MOA turrets and MOA reticle. A mrad model will follow suit shortly thereafter. I expect the reticle to look very similar other than the MOA vs mrad difference. 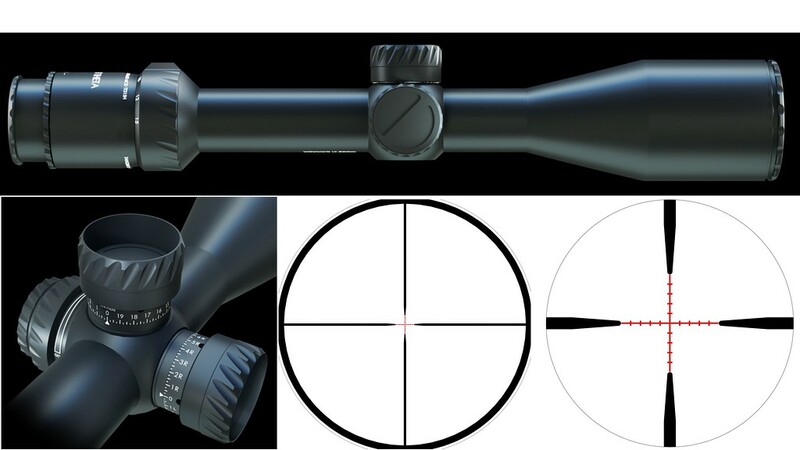 Very importantly for a hunting scope, on 3x the reticle looks like a nice bold duplex reticle. The only other difference with the current products is that it can survive immersion in a more shallow depth of water, but I try to not go scuba diving with my scopes, so I am not terribly concerned. It is still waterproof. I am not a MOA guy, but when a mrad version is available, I will see if I can get my hands on it. My hunting rifle has a Leica Magnus on it with a SFP reticle and 1.8-12×50 magnification range. I think it will make for an interesting discussion if I run it next to a FFP TT315H. I see the FFP vs SFP arguments playing out all the time, so perhaps it is worth my while to go through it carefully and thoroughly with two of the best scopes in the world side-by-side with each other.